Southern paranormal cozy mystery with ghosts, witches and a murder or two. Hope, Faith and Charity plan to open a Wiccan school and white witches’ potion shop in rural Sunflower County Mississippi. 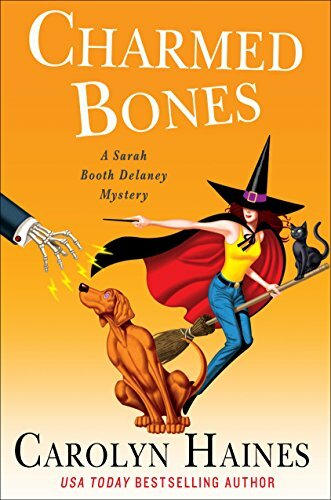 Sarah Booth Delaney and her partner in the Delaney Detective Agency, Tinkie Richmond, are paid to dig up some dirt on the three newcomers. The witches cast a spell to make Tinkie pregnant and Sarah Booth hook up with the hunky Sheriff Coleman. Soon, someone is killed. Was the victim scared to death by the mysterious force in the apple orchard? Charmed Bones is #18 in the series but it reads fine as a standalone. Reading the synopsis above, the plot sounds overblown but it is totally believable while immersed in the book. I found the quirky Southern characters were the best part of Charmed Bones. By the end of the book, all seemed like genuine friends that I wanted to spend more time with. Now I just have to decide to continue the series from here or start at #1. This entry deserves 4 stars! Thanks to Minotaur and NetGalley for an advanced copy.